The No-Show paradox occurs whenever a group of identically-minded voters is better off abstaining than by voting according to its preferences. 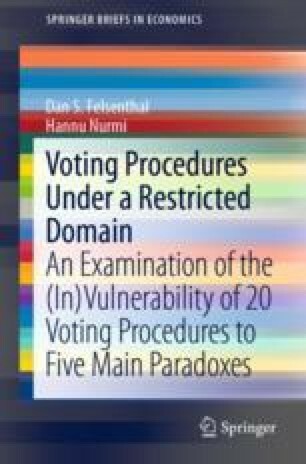 Moulin’s (Journal of Economic Theory 45:53–64, 1988) result states that if one wants to exclude the possibility of the No-Show paradox, one has to resort to procedures that do not necessarily elect the Condorcet winner when one exists. This paper examines 10 Condorcet-consistent and 10 Condorcet-non-consistent procedures in a restricted domain, viz., one where there exists a Condorcet winner who is elected in the original profile and the profile is subsequently modified by removing a group of voters with identical preferences. The question asked is whether the No-Show paradox can occur in these settings. It is found that only 2 of the 10 Condorcet-consistent procedures investigated (Minimax and Schwartz’s procedure) are invulnerable to the No-Show paradox, whereas only 3 of the 10 non-Condorcet-consistent ranked procedures investigated (Coombs’s, the Negative Plurality Elimination Rule, and the Majority Judgment procedures) are vulnerable to this paradox in the restricted domain. In other words, for a No-Show paradox to occur when using Condorcet-consistent procedures it is not, in general, necessary that a top Condorcet cycle exists in the original profile, while for this paradox to occur when using (ranked) non-Condorcet-consistent procedures it is, almost always, necessary that the original profile has a top cycle. This chapter is based mainly on Felsenthal and Nurmi (2018). The strong No-Show paradox occurs in a profile where a group of identically-minded voters is not only better off abstaining, ceteris paribus, but gets its most preferred candidate elected, whereas by voting according to its preferences some less preferred candidate wins. Are there any instances of the strong No-Show paradox among the preceding examples? A candidate, x, is said to be Pareto-dominated in a given a preference profile if all voters prefer some other candidate y to x. Show by way of an example that the Successive Elimination procedure may nevertheless lead to a Pareto dominated candidate being elected. Given the example just constructed, would it be correct to state that (a) the elected candidate is necessarily a Condorcet loser and/or that (b) the elected candidate is never the first-ranked by any voter, and/or (c) every voter would have been better off had the voting agenda been different? Show by way of an example that the Plurality with Runoff procedure is vulnerable to the No-Show paradox when there is no Condorcet winner in the original profile. Show by way of an example that the Plurality with Runoff procedure is vulnerable to the No-Show paradox in the Condorcet domain when the Condorcet winner exists but is NOT elected in the initial profile. How does the Alternative Vote procedure perform in the above two settings? All profiles discussed in Sects. 5.3.1–5.3.8 exhibit the vulnerability of the respective procedures to the strong No-Show paradox. and the agenda of pairwise majority votes: (i) b versus d, (ii) the winner versus a, (iii) the winner versus c. Here c wins, but is Pareto-dominated by d.
(a) No, it is not; (b) yes, it is correct; (c) yes, it is correct. Here a wins. Now remove two b > c > a voters, then c wins. Here c is the Condorcet winner, but b wins the runoff against a. Now, remove five a > c > b voters and c becomes the winner. In the same way as the Plurality with Runoff procedure, as is always the case in three-candidate contests. Felsenthal, D. S., & Nurmi, H. (2018). The no-show paradox under a restricted domain. Homo Oeconomicus. https://doi.org/10.1007/s41412-018-00079-w.